I often receive questions like the above from new parents-to-be and while I don’t feel like I’m the most-qualified person to talk on the subject, since we have had two babies (so far!) without spending much money at all in the process, I wanted to share what I’ve learned so far in this new series Having a Baby Without Breaking the Bank. I hope that those of you who have had children will also chime in and share what you’ve learned as well! Despite what you often hear, having a baby doesn’t have to cost you an arm and leg. We had our first daughter when my husband was in law school and we were living on around $1000/month. By the grace of God and lots of creativity, we managed just fine! There is often a tendency as soon as one finds out they are pregnant for the first time, to want to start buying things–baby things, maternity clothes, baby books, nursery furnishings, and on and on and on. My advice? If you can’t afford it, don’t buy it. There are so many things that pregnancy books and magazines and even friends will tell you are must-haves. And you can fork out hundreds (or even thousands!) of dollars on these items needlessly. In my first pregnancy–when we were living on our very meager budget–we actually didn’t buy anything aside from a few maternity clothes, a few blankets, a few packages of diapers, and a few sleepers. Everything else we needed for the pregnancy and our little girl we either borrowed from some one, were given as a gift, or did without. My mom had advised me not to buy anything since it was our first baby and she was pretty sure many folks would be generous in their gifts to us. She was exactly right. Though we were in a small town that was new-to-us and didn’t have a lot of local friends, we still ended up having three baby showers and receiving plenty of gifts. We didn’t have an abundance, but we had exactly what we needed. The good news was that since we were living in a tiny basement apartment, we didn’t have room for much of anything either so if we had purchased a lot of stuff, we would have quickly run out of space to store it. And we also learned that you can survive quite fine and have a happy baby without all of the dozens of gadgets and gizmos advertised everywhere as the latest and greatest things for wee ones. So if you are a first-time parent, I’d advise you to think twice before buying a lot of stuff before your baby is born. You might end up with being given almost everything you need–or even more than you need! Last time in this series we discussed how having a baby really doesn’t have to cost you a fortune. If you didn’t get a chance to read it yet, be sure to go here and do so. The numerous comments left on the post were incredibly insightful–you all are one great bunch of wise people! Today I want to talk about what I see as the basic essentials one needs to have and care for a baby. Obviously, there are variety of opinions out there when it comes to “must-haves”. I’m not an expert, just a mom who has raised two young vibrant little girls without spending a lot of money to do so. First off, we must start by asking ourselves, “What does it really take to raise a baby?” I believe our society has become so materialistic and consumer driven that we hardly know how to even think in basic terms. And that’s about it, folks. Seriously. There are other things that are nice to have, such as a swing, a sling (or ERGO), a few nicer outfits for baby to wear out of the house, a diaper bag, and so forth. But none of those things are absolute necessities. If you have any baby showers at all or get any gifts, you can see how easily you could accumulate the few items you really need for your baby. And that’s why I recommend you don’t buy anything until after your baby showers (if you will be having any). There is no point in buying a lot of items you don’t truly need if you can’t afford them. There is no need to buy name-brand, brand-new clothes for your child. If they are anything like most little children, they will likely be quickly staining them or growing out of them. So you might as well get them as inexpensively as you can! If someone offers to share their hand-me-downs, willingly accept them. Sign up for your local Freecycle.org and watch for folks who are getting rid of baby clothes and other items in your area. You can often snag sacks of baby clothing and other baby things this way–all for free! Freepeats.org is another online baby site which allows members to trade gently used baby and maternity items for free. Sign-up is only $1 right now, so this is definitely something to consider if there is a Freepeats group in your area. Other great options are thrift stores and garage sales, of course. Also, check and see if there are any church rummage-type sales or consignment sales in your area. These are often goldmines! 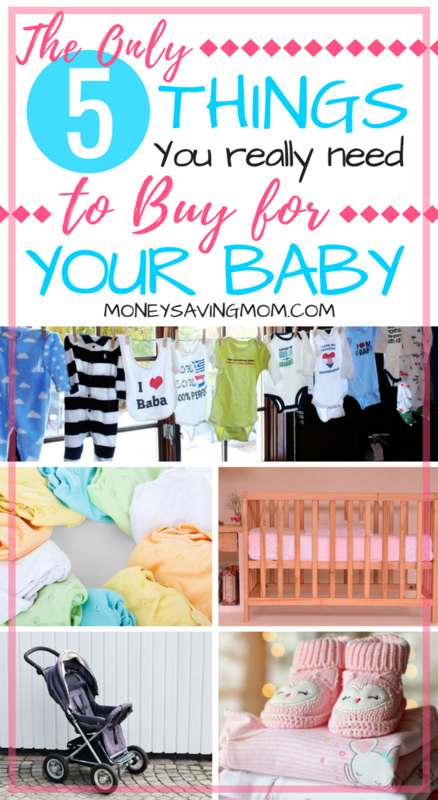 And if you start looking for items at least a six months before your baby is born, you’ll likely be able to accumulate everything you need for pennies on the dollar this way. For the record, I recommend buying your baby’s bed and car seat new, just out of safety precaution. But that doesn’t mean you need to spend an arm and a leg. Start looking at least a few months before your baby is born for deals at local stores and online deals. The majority of the time, by hitting an online sale and combining it with a coupon code plus cashback from eBates, you’ll be able to get a pretty good deal. Also, if you are in the market for deals on new baby items, be sure that you check out BabyCheapskate and BabyGoodBuys. Both are websites dedicated to alerting you to the best baby deals and freebies out there. Oh and before I forget, The Natural Mommy has a great two-part series up on Reducing the Cost of Birth and Babies which I highly recommend you check out here and here. You might not agree with all her conclusions (just like you probably don’t with mine!) but hopefully it will give you some more food for thought! That about covers everything on the list of essentials except for diapers. Next week, I’ll talk about saving money by cloth diapering and or stockpiling disposable diapers. I’d love to hear your thoughts on what you think is a list of absolute necessities for having a baby. What are your best ideas for acquiring these inexpensively? When my first son was born, I was teaching high school full-time. Living on two incomes had allowed us to live pretty luxuriously. However, we knew that I was going to stay home for at least the first year, so we began to economize during my pregnancy to pay off my student loan and to create an emergency fund. That was a nice cushion for a time, but things were still tight living on one income. One year has become twelve and one child has become six. I’ve been more than blessed to be home with my children. Yet, with each new addition to our family, I have felt a little squeeze of pressure. Or should I say, our budget felt the squeeze? How could we accommodate one more mouth to feed? And though the births of each child has always been surrounded by happy moments, I often became stressed by the vast amount of supplies that were needed, particularly in the early weeks. How was I going to fit diapers, wipes, and extra feminine products in the budget? Now twelve years and five children later, we still try to economize. But I am pleased to report that with the birth of our sixth child last summer, I did not feel the squeeze. Neither did our budget. Did we have a huge income in comparison to years past? Did we win the lottery? Quite the contrary. I simply applied what I knew about stockpiling to the purpose of preparing for a new little one. Not only did I spare us some change but I also saved time and energy in not shopping for these items in the busy hormone-induced daze after the baby arrived. Here are my suggestions to help you ease the squeeze on your budget. — Put out a call for coupons. Let friends and family know that you are looking to collect coupons for baby and other post-natal products. Keep your eyes open for coupon fliers in all the free stuff you receive from your doctor’s office or hospital. Keep these coupons with you at all times in an envelope in your purse or wallet. You never know when you’ll find a good deal; coupons will make a good deal great. Don’t limit yourself just to baby items. Consider the other needs a new mom has, such as feminine pads, Tucks, Advil, etc. and collect those coupons as well. — Learn to play the Drugstore Game. I learned almost everything I know about CVS-ing from Money Saving Mom® and following along with other bloggers who report here every Saturday. Drugstores like CVS or Walgreens often feature great prices on baby and feminine products as do Walmart and Target. Choose a drugstore that is close to home and learn how their sale system works. — Keep track of prices. In order to stockpile effectively, you need to know what a good deal is. You already know that Money Saving Mom® regularly reports on great deals. Baby Cheapskate also keeps track of diaper and formula prices each week. Check to see where the deals are so that you’ll know a good one when you see one. — Buy low even if you don’t need it right then. This is key to creating an advance supply before your baby is born. Keep your eyes open for good sales and clearance opportunities. Last Spring I happened to find jumbo diaper packages for $2.25 each because the manufacturer was changing their packaging. I bought all that I had room in the budget for and that kept us in diapers for quite some time. As long as you will use it in the next few months or so, it is probably worth buying multiples of an item, provided that you can pay cash for it and still meet your other household needs. If you’re going the disposable diaper route, you know you will be using them. Buy diapers, wipes, and baby toiletries at low prices and store them up. — Protect your investment. Your stockpile is not just worth what you paid for it. It also represents time and energy spent to hunt and capture the good deals. Don’t leave it where it can be damaged. Paper products should be protected from excessive temperatures and rodents. So, be wise where you store these items. Top closet shelves and under beds and cribs are great places to keep your stock safe. There is so much joy in welcoming that new little one–live it to its fullest, without being worried about how you’ll pay for it all. 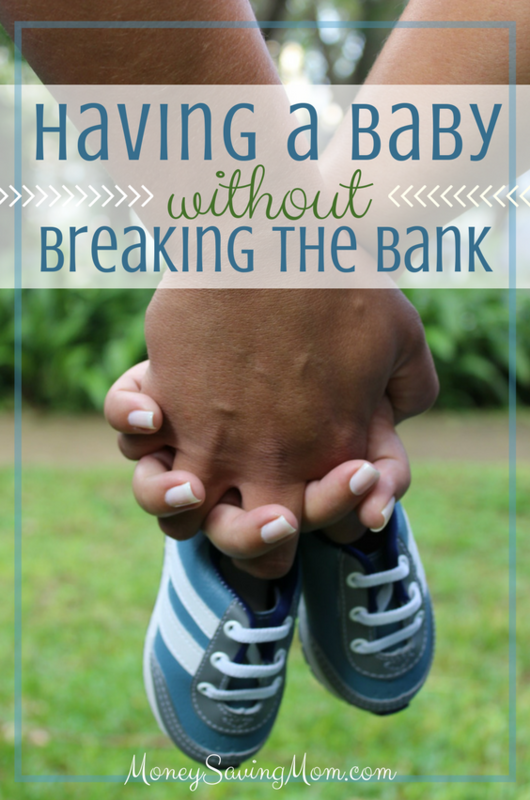 With a little clever maneuvering, you, too, can have a baby without breaking the bank. Life as MOM. Join her on “the Road to Joyful Motherhood”–because no one wants a crabby mom. From Crystal: We have lots of soon-to-be new mommies reading here who have asked me for specifics on diaper stockpiling. If you have some experience in this area, I’d love to have you share your thoughts on how many diapers (and in which sizes) you would recommend stockpiling ahead of time, how long you think it takes to build up a good stash, and where you find the best diaper deals. In the near future, we’ll have a counterpart post and discussion on cloth-diapering. Cloth diapers have come a long way from what our grandmothers used to use. In fact, there are so many great options these days when it comes to cloth diapering, that it can be a bit overwhelming for beginners. All-In-One Diaper (see an example here)—This is a tapered fabric diaper that has an outer layer of Polyurethane Laminate (PUL). This is a water-proof material that works very well at preventing leaks. This type of cloth diaper is the most similar to disposables. It doesn’t require a cover, and it usually has velcro or snaps. The only draw-back with this type of cloth diaper is that it can sometimes be harder to clean, and take longer to dry. Fitted Diaper (see examples here)–This diaper fits snuggly on the baby, is all cloth and it requires a waterproof cover. It usually has velcro or snaps so that it can be easily secured on the baby. This diaper cleans and dries easier than an All-In-One, but it can still take a while for it to dry. Pocket Diaper (see examples here)—A pocket diaper usually has two layers of fabric and has a pocket for inserts. You can place fabric inserts or prefolds in the pocket for absorbency. Pockets can either have an outer waterproof layer so that they are more like an All-In-One when stuffed, or they can just have two absorbent fabric layers so that they are more like a fitted when stuffed. Pockets are very easy to clean and dry, because you remove the inserts when washing. Prefolds (see examples here)–These are like what your grandmothers used to use. They work by folding the diaper onto the baby, and attaching it with either pins or a snappi (more on snappis later). These can be more work to fit on the baby, but they are so easy to clean and dry. Prefolds require a cover. Flats (see examples here)—Flats are a flat piece of fabric that is folded into the shape of a diaper. It is placed on the baby and then secured with a snappi or pins. Flats are nice because they clean and dry the easiest, and they also give a very trim look, even though they do require a cover. Flats are one of the least-expensive cloth diapering options. Even if you aren’t good with a sewing machine, you can make some flats out of old shirts, towels and other materials. Receiving blankets are great to use as flats. They are flannel, and flannel is very absorbent. Covers—If you plan on using fitteds, prefolds or flats, then you will want to have covers. There are many types of covers. You can buy covers online or you can make your own. Fabrics that make great covers are PUL, Fleece, Wool and of course there are the original plastic pants that our mothers and grandmothers used to use. I like using fleece and wool because they allow for breathing of the skin, and they are so cute! You can easily make your own wool or fleece pants for babies out of your old sweaters and hoodies. Here is a quick tutorial on how to make some recycled wool/fleece pants. Inserts–If you use pockets or want added layers of absorbency, you will want to buy or make some inserts. Usually I just use prefolds or fold up some receiving blankets. Receiving blankets are flannel, thus making them great for absorbency. Wetbag–This is a waterproof bag used to hold soiled diapers. There are many places online that you can buy these, or you can make your own. PUL is a great fabric to make wetbags out of. You can also find the 3 packs of waterproof bags in the camping section at major retail stores. Those are fairly inexpensive, and I’ve found that they work very well for this purpose. Cloth diapering is a way our family saves a lot of money each year. However, building up a stash of cloth diapers in the beginning can be costly. To build a good stash, if you do it wisely, you can expect to spend somewhere between $200-$400. The average person will spend $1,800-$2,000 a year on disposables for one child. Now, if you use coupons combined with sales to purchase disposable diapers, you’ll not spend that much, but you still will probably spend at least a few hundred dollars, if not more, on diapers per child. So while the initial investment in purchasing cloth diapers might seem steep, if you plan on using them for more than one child, you will likely recoup your investment–and maybe even many times over! If you have a knack for sewing, you can sew your own diapers and accessories which will make them much more affordable than purchasing them! I’ve written a post on a quick and easy way to sew a prefold diaper here. I’ve also made my own pocket diapers and show you how you can do that here. Crystal blogs at The Thrifty Mama, where she posts deals, coupon help, and tips for living a more natural and thrifty life. She’s a stay-at-home Mom to two small children, and does her best to live more green and natural without breaking the bank. Note from Crystal: Have you used cloth diapers? If so, which kinds did you use and what did you find worked best for you? How did you build your cloth diaper stash on a budget? I’d love to hear your ideas and input! Certainly one of the Finer Things in Life is becoming a parent. While one of life’s greatest blessings, the thought of all the stuff that’s about to consume your home and your budget can be overwhelming. Don’t let the cost of having a baby (or two, or five…) overshadow the joy. Bringing home a baby doesn’t have to break the bank. Babies are born with a strong appreciation of the Finer Things. They are very basic creatures with very basic needs. Feed them, clothe them, keep them warm, safe, and clean; love them. And that’s about it! In fact, anything you purchase beyond meeting baby’s needs could add unneeded stress to an already intense time in your life. Feed Them. I know it’s a personal choice and I don’t judge those who don’t breastfeed for whatever reason, but the research is tremendously convincing: mama’s milk is best for baby. No ifs, and, or buts about it. As a bonus, it’s free! If you have a choice, why spend $1,000 (at least, and not including feeding supplies) on formula in the first year of baby’s life when the good stuff is readily available, always the right temperature, easily portable, and free? Breastfeeding a baby deserves its own post, but may I quickly encourage those of you who are preparing for motherhood for the first time to please surround yourself with breastfeeding resources and information and friends? Having support for those first few (very tough for me!) days and weeks will increase the chances of your success and your enjoyment of the experience. Clothe Them. Sweet little baby clothes are hard to resist, huh? I know the temptation. Fortunately, hand-me-down and garage sale clothes are just as cute as the over-priced garments luring you in the store. Baby needs clothing, yes. Brand new clothing at a premium price? No. Keep them warm, safe, and clean. When registering for baby showers and browsing garage sales before our first was born, I tried to keep something in mind: If my mom didn’t need it, neither do I.When bringing home baby, your day will be full to the brim meeting baby’s basic needs. Why clutter your home and your time and your mind managing all that unnecessary baby stuff? I know that many of you will scream that a baby monitor is an absolute necessity. I thought so, too, so we registered for one and received it at our baby shower. Four and a half years later we finally took it out of the box when our third baby was six months old. She is now 19 months old and I think we’ve used the monitor twice.Convenient? Yes (if I could ever remember to use it). Necessary? Not really. I’m not trying to discourage you from purchasing a baby monitor; just giving one example of how the “necessary” isn’t always so. Love them. Hold them, read to them, sing to them. Word to the wise: you are not impressing your baby with the frou-frou. There are endless bright, loud, entertaining toys available for baby. A few of them (I like having a bouncy seat and gym mat) are very convenient and give mom a nice reprieve. Don’t overdo it, though, because what does baby really want? You. Keep it basic. If you must have the frou-frou, shop at garage sales or online at craigslist because parents of equally unimpressed babies are getting rid of barely used items for cheap! The marketing of baby stuff continues to be lucrative as parents are convinced that having the newest, brightest items will make their baby happier and smarter and safer. Not so. Stick to the basics. Your baby will thrive, and so will you. Blessings to those of you preparing to bring new life into this world! A stay-at-home mom, Amy gave up an eight year teaching career at one of the largest schools in her state to move with her husband of nearly 10 years and their three children, ages 5, 3, and 1 to Tiny Town two years ago. Amy takes joy in caring for her family, finding a good deal, volunteering at her local library, and blogging at The Finer Things in Life. Note from Crystal: Photos are of my second daughter, Kaitlynn, when she was a wee little one. Isn’t she precious?! Open any pregnancy magazine, and you’ll see that parents-to-be are expected to devote considerable time and money to furnishing and decorating a nursery for the new baby. Upscale publications even depict parents agonizing over how to apply their sophisticated decorating sensibilities to a baby’s environment by finding curtains, crib bumpers, and wall appliques that aren’t too cutesie. I have been spared such dilemmas, because I never put together a nursery for either of my girls–nor am I planning one for the baby we’re expecting this summer. What I have realized over the course of raising two babies is that the last thing an infant needs is a room of her own. Since moving to a bigger home is one of the most expensive changes families make when they have kids, it’s worthwhile to consider whether a move can be postponed or avoided. With our first baby, we lived in a one-bedroom condo and didn’t have a separate room to decorate. At the time, this situation pained me, because I felt like I was sitting out of an all-important nesting activity. I did try my best to decorate and furnish the end of our bedroom that would be the baby’s, and this compromise ended up fulfilling both the baby’s needs and my need to play out the full expecting mother experience. I worried, during my pregnancy, that we were terrible parents for not moving to a bigger place–something that would have been impossible for us at the time. I didn’t realize that for most families, that lovingly decorated new nursery is superfluous in the early months because babies typically spend their nights in the parent’s room. In fact, the American Academy of Pediatrics recommends that newborns sleep in the same room as their parents. We put the changing table up against one bedroom wall, hung a baby organizer and some baskets on the wall for holding burp clothes and little hats, and put a Pack ‘N Play next to the bed as a bassinet. The crib we placed in a spare corner of the living room, so I could keep an eye and an ear on my newborn during her naps. The only time we ever needed the baby monitor we’d received at the shower was when I went to the basement to throw in a load of laundry. When the baby was older, we put away the Pack ‘N Play, got rid of most of our bedroom furniture besides the bed, and managed to squeeze the crib into our room. When does a baby need a separate room to sleep in? Technically, never, if you think about the fact that in the course of human history, the idea of private bedrooms for each person is a relatively recent innovation. Even today, it’s not universal–plenty of cultures worldwide still consider it normal and desirable for the whole family to share a room, or even a bed. But practically speaking, where to keep the children is a decision that should be based on each family’s needs and resources. We began to feel the need to get the baby out of our room when I wanted to stop getting up to nurse her at night. This happened between the ages of 12 and 18 months. If I had it to do over again, I probably would have moved the baby’s crib back to the living room at that point. Instead, we kept the baby in our room and when the she cried–when my attempts to soothe her without nursing failed–we’d try to sleep through her yells. One of us would usually end up on the couch, where there was not enough room for two. It was not a fun time. This does not mean, however, that you need to move to a home with a separate bedroom for the baby by the time you want to night wean or when she hits a certain age. For most babies, the period when there is a lot of crying at night is short (although it feels like eternity at the time). Some families are even successful getting their babies to sleep through the night without any crying. You can probably find a temporary solution that allows other family members to get their rest if the baby’s being noisy. When our second baby was a few months old, we moved to a three-bedroom house. Our plan was for her to transition from our room to sharing the second bedroom with her sister, then 3 years old. The third bedroom we reserved as a guest room/den.Naturally, the second baby went through a time when she was waking her sister with nighttime crying. We experimented with various set-ups, moving the Pack ‘N Play to the guest room and the living room at different times. Eventually, we moved her back into the kids’ room and her sister learned to sleep right through the crying. And, then, thankfully, the crying mostly stopped. Probably the most important issue when living in a small home with a new baby is not the baby itself, but all the equipment that often comes with a baby. If you share a small space with a baby, it’s essential to keep equipment and toys to a minimum to stay sane! 1) The baby doesn’t have to be changed in the same place she sleeps. In fact, the bathroom is the best place for a changing surface if there is room. If space is really tight, skip the changing table and simply keep a basket of supplies and a changing pad wherever’s handy. 2) One family I know put the baby’s crib on the landing between the bedrooms. Just make sure that the crib can’t roll down the stairs! 3) To make room for a crib in a kid’s room, consider bed sharing or bunk beds for older siblings. 4) Check out this breakfast-nook-turned-nursery created by Maggie Mason, who blogs at MightyGirl.net. Their budget was $1,400, most of which went toward having doors custom-made for the formerly open nook. 5) At the website, Apartmenttherapy.com, readers recently weighed in on how long a family of three could live in a 400-square-foot apartment. Read the thoughts and ideas shared here. 6) There’s a helpful tutorial on EHow on turning a walk-in closet into a nursery here. Freelance writer Carrie Kirby blogs about frugal living at Shoplifting With Permission and about parenting at My Funny, Funny Family.